Faster and Louder: Let It Rock! Hot damn! 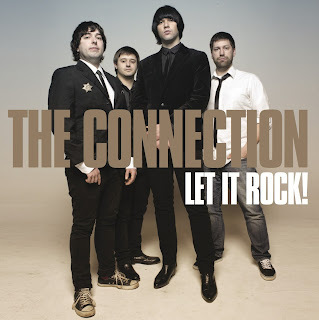 I've been a big fan of The Connection pretty much from the first days of this blog (this is my fourth time posting on the band). A new Connection record is always an event worth celebrating. But nothing could have prepared me for the sheer awesomeness of the band's brand new LP. Let It Rock!, The Connection's second studio album, is very similar in spirit to its excellent 2011 debut. But sonically, it's at another level entirely. It's superbly produced and boasts a "bigger" sound. Its songs are stylistically more diverse. You'll still hear plenty of nods to early rock n' roll and the British Invasion. But this record throws in a little country style and some early '70s Stones type jams. And the use of additional instruments (piano, steel guitars, acoustic guitars, sax) really gives some of these songs a different feel. If New England's Newest Hitmakers was a pure nostalgist's treat, then Let It Rock is just a great rock n' roll record, period. The thing that puts The Connection in the top tier of today's rock n' roll is its songs. In the last couple of years, Brad Marino and Geoff Palmer have stepped up their songwriting chops in a major way. At this point, I'd put these two up there with all the top songwriting tandems in today's pop/rock n' roll scene. Let It Rock! is so laden with A-grade material that it could pass for some long lost best-of collection from 40 years ago. "All killer, no filler" is such a rockwriter's cliche that I'm usually loathe to use it. But in the case of this album, I've got to make an exception. "Wrong Side of 25" opens the record with a winning combination of power pop and rock n' roll that brings the Real Kids to mind, and I quickly assumed that it had to be "the hit". Well, I was kinda wrong - the whole album is hits! From the Beatle-esque perfection of "She's A Keeper" to the Beach Boys via Chuck Berry fun of "Crawling From The Wreckage (Of A Saturday Night)" to the Stonesy swagger of "Girls In This Town" to the peppy country pop of "Susan", Let It Rock! is stacked with the kinds of songs you wish they still played on the radio. Heck, you actually can hear some of these songs on the radio if you turn your SiriusXM dial to 21! Little Steven loves these guys, and so do I! Combining the non-stop hooks of a perfect power pop record with the energy and excitement of pre-hippie rock n' roll, Let It Rock! has pushed The Connection into my top five list of current fave bands. Of course I dig "classic" Connection songs like "Not How It's Gonna Be". But every bit as pleasing are the band's efforts to try new things. "Nothing About Me" integrates beautiful melodies, amazing backing vocals, and killer guitar work into the country rock equation. "Haze" sounds like the Jesus and Mary Chain minus the noise. There's simply nothing close to a weak track on this record. You get the whole way towards the end of the album and come across songs like "Melinda" - most bands wish they could write one song that good! With this kind of music, there's always going to be the discussion about the difference between "retro" and "timeless". To me, The Connection are definitely the latter. Although their influences are obvious, I don't think of them as a "tribute" or "revivalist" band. They are proof of rock n' roll's staying power and continuing relevance to our everyday lives. There's no shelf life on music that makes you feel good and gets you up and dancing. If you put these guys on a time machine and sent them back to 1966, they could totally hold their own. Yet even in the present day, their sound is fresh and invigorating. In what is turning out to be a blockbuster summer for albums, Let It Rock! is up there with the best of 'em!